It’s raining again. I don’t mind the rain so much; in terms of my own comfort level, I actually prefer this gentle weather to 95 degrees with high humidity. But I recognize that the wet is responsible for the blight that’s affected tomatoes and potatoes and all sorts of crops all over the North East, and our local farmers have pinned it on climate change. So I am routing for sun and a drier spell. My kids are both taking a nap right now. My husband is biking, rain or no. I have been tidying the house, cleaning out the nasty drawer next to my bed which contains twenty five different kinds of lotion, a disorganized mass of sewing materials (mostly threads), some dental floss, ear-plugs in various stages of use, barrettes, bookmarks, emery boards and loose band-aids separated from their boxes. Before their nap, my children were both in Elle’s room on her “new” big girl bed: a plastic pink toddler bed with a teddy bear’s head as the backboard and a crib mattress. We put her other crib mattress under the bed and then pulled it out so it looks sort of like a trundle bed, which, if you are three, is almost a bunk bed, which is the grandest, most excellent sleeping situation imaginable. The bed is completely covered with stuffed animals and pillows and blankets, as Elle like to make a big nest for herself, which she crawls into for sleeping. Jay thought this was the most exciting thing ever, and squealed with delight as he hurled himself onto the top of the pile and then fell over backwards onto the lower “trundle.” This made him laugh even harder: huge chortles of pure glee. I sat next to them and just watched and listened. What could be better than your own two kids squealing and snuggling like a litter of puppies? So far, nothing. Elle is three, and to date, I like three better than two. Either that or I have changed. I look back on last year, the year of Jay’s arrival, and I feel like I’ve come over a tight mountain pass and am now on a smooth level path. Maybe it’s the yoga; maybe it’s the meditation and journaling. Maybe it’s the knitting. I think it’s just plain grace. Or mabye it’s that three really is easier than two. I’ll find out when Jay hits that marker in August 2010. Speaking of mountain passes, we did a lot of hiking in the Adirondacks last week. 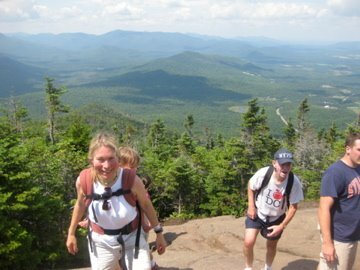 All the members of my family are 46rs, which means that we’ve climbed all 46 peaks over 4000 feet in New York State. This really means that we have a father who is an avid hiker (though his season is extremely limited to one week every summer, and he climbs wearing tennis shoes, eschewing walking sticks and crampons) who thought it was fun to drag his whiny wife and daughters up tall mountains every summer. Eventually we all stopped whining and caught the Fever which compels one to hike in 45 degree rain and cloud cover that erases any kind of view. In 1986 my father figured out that my mother, the most reluctant climber of all time––albeit extremely athletic––was within 15 peaks of 46. My mother, always the historian, also figured out that she would be able to bag these peaks before her 47th birthday, and so agreed to what can only be called a campaign. 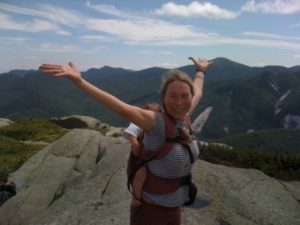 For the next three years, and then continuing on for our own 46r goals for another three, we Nieldses hiked the most obscure, trail-less, bramble-filled, viewless mountains in the Adirondacks. We were cursed with cold wet weather, but blessed with no injuries, victory, and best of all, the gifts one gets only by climbing mountains. What are these? Well, for me, this strange thing happens when I hike. I am a middling kind of athlete. I am not fast nor particularly skillful, and I am definitely not strong, but after the initial shock to my body that it’s being asked to do something other than play guitar or write, it really is a good sport. It’s sort of like my dog George Harrison: it goes along with the program. And after about 45 minutes of slogging, when my heart is pumping nicely and my muscles are working in harmony, my mind lets go of its regular tangle of plans and fears and instead gets creative. It also gets seriously involved with the present moment. This is especially true when it’s carrying its son on its back. 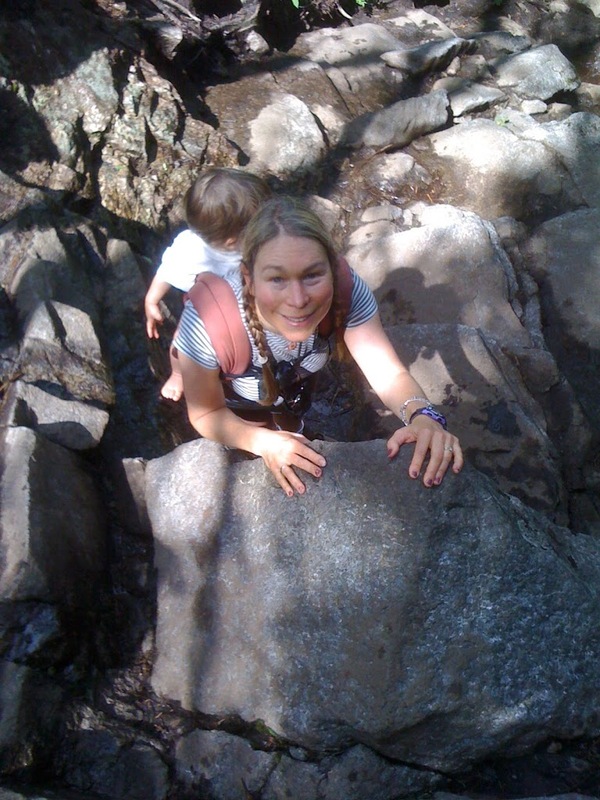 Paying attention carries a lot more value when to fail to do so would mean slipping on a wet mossy rock and tumbling several yards down with an eleven-month old in tow. Jay loved hiking. The first day, we felt a little guilty: he’s just learning how to walk, and he’s so excited about what his own little body can do that he barely wants to sleep. Would you want to sleep if you suddenly figured out that your body could fly? But riding on mama’s back is apparently evolutionarily charged with positive associations; after all, for millenia, moms have been carting their tots around in slings and on backs, over the Andes and the Pyrannes and Kilimanjaro and the Himalayas. Babes are used to it. Jay slept peacefully for a few hours, then woke up, singing and drumming lightly on my shoulders. Tom mostly carried him on the way down when I feared that my spaghetti legs would fail. He liked dad’s back as much as mom’s. I thought about camping out and waiting for Tom to bag the peak. That wouldn’t be so bad. But Jay wasn’t scared. And I thought of all those mothers who have climbed before me, the mothers of the Andes and Himalayas. I prayed to their spirits, and saw the summit. When I finally arrived, Jay’s hair flying around his little head like a halo, I said, “We are at the top of the world.” He said, “Nah nah,” and clapped his hands. Tom found us a place behind a big rock where we could eat our lunch and gaze at Algonquin, and I remembered that it’s not until we walk through our fears that we overcome them. 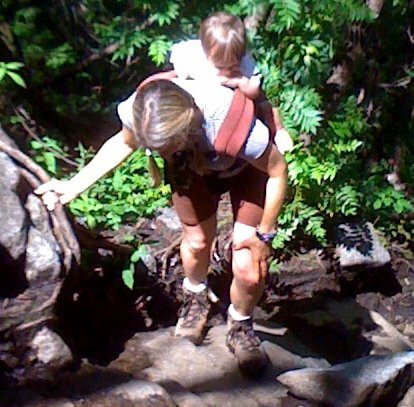 My father carried me up these mountains when I was Jay’s age. We risk our children’s lives in a much more (statistically) dangerous way when we strap them into their car seats and drive across town. What I gave to my son that day was the model of courage. Not the kind of courage that shrugs at danger, but one who feels it and goes up anyway. Inspring. Great photos too. It’s good to have the blog back! In the background of the last photo is what is known locally as The Range. My father is incredible at naming any and all mountains from the tops of peaks, but I am still learning.